Safety is critical when it comes to your furnace and your family! Regular maintenance and repairs will help prevent accidents from happening. When is comes to safety, we at Yeager's Heating Service are all about helping you keep you and your family safe. 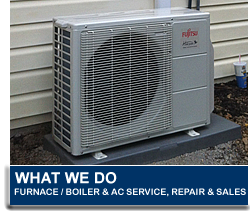 We can provide free onsite estimates of your existing furnace or air conditioner and provide true options for making sure your system is optimized for performance and safety. Making sure that your system is running optimally will provide peace of mind knowing that you're getting the most our of it while making sure the household is safe at all times. 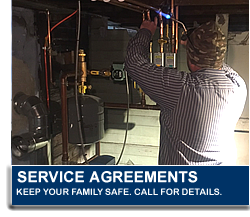 Having regular service on your system will ensure your family is safe. Visit this link for more information on our Maintenance and Service Contracts. *Don't think you need to get your AC unit inspected and maintained annually at your house? Think again!!! We were called to a residence in Windber who said he smelled smoke coming from his AC unit at his deck. When we arrived there, we noticed a burn mark on the metal housing of his AC unit. The metal was being burned right through from the inside of the unit. We removed the housing and discovered the biggest chipmunk nest we had ever seen embedded around all of the electrical wiring of the unit. The nest had caught on fire in the unit. The nest had been burning the entire inside of the unit out! It was a miracle that this didn't set the house on fire as it had started burning a couple days before. All of the mechanical components of this AC unit had to be completely replaced as the fire had burnt up the wiring and computer units as well. 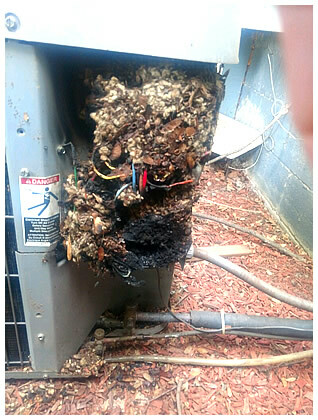 Please call us to have your AC unit insepcted and maintained regularly as rodents like these can cause a host of damage to your AC unit and even your house!